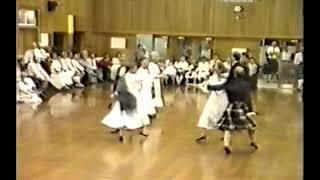 Scottish Country Dancing demonstration from 1994 Anzac School, Wellington, in Onslow College. The dances done are Argyll Strathspey, Mrs Stewart's Jig, and The Rose of Glamis. The entry and exit routines were devised by Noeline O'Connor. The music is provided by Peter Elmes, John Smith, and Merren Simmonds. This was resurrected from an old VHS tape, and converted to an mp4 by John Patterson. Sadly the quality is affected by the deterioration of the tape, but the dancing and playing is of quite high quality.